Daddy Yankee and Joss Favela were named Songwriter/ Artist and Songwriter of the Year, respectively, at the 25th annual ASCAP Latin Music Awards, held last night at The Vanderbilt Hotel in San Juan, PR. 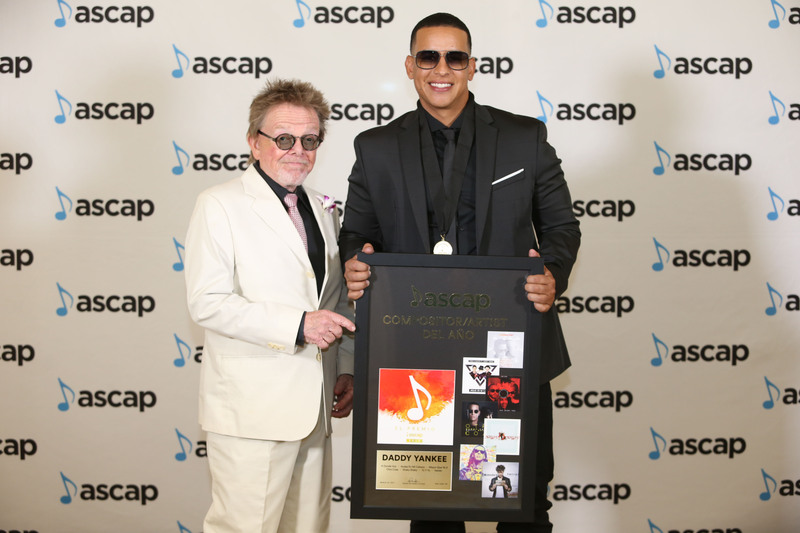 ASCAP President Paul Williams was joined by ASCAP Vice President Latin Gabriela Gonzalez to present the award to Joss Favela and MLB Star Bernie Williams surprised Daddy Yankee on stage to present him with the Songwriter/Artist of the Year Award. This is the second time that Favela has received the Songwriter of the Year award and Daddy Yankee's first win in that category. Tropical music star Gilberto Santarosa presented the ASCAP Latin Heritage Award to El Gran Combo de Puerto Rico in recognition of their unique and enduring contributions to Latin music and Vico C received the ASCAP Vanguard Award from Draco celebrating his impact on new and developing musical genres that are shaping the future of music. The songwriters and publishers of ASCAP's most performed songs in Latin Music in 2016 were also recognized during the invite-only awards ceremony. ASCAP Vice President US Latin and Latin America Gabriela Gonzalez and Executive Vice President, Membership John Titta presented the Publisher of the Year award to Sony/ATV Discos Music Publishing, and the Independent Publisher of the Year to BMG Gold Songs. The Latin Song of the Year award went to "Duele El Corazon" (written by Enrique Iglesias, Silverio Lozada, MhmdHasibur Rahman; published by Azul Siete Music, El Global Music, Kobalt Songs Music Publishing, WB Music Corp., Xuanlu Avalon). Awards were presented throughout the evening in the following categories: Pop, Tropical, Regional Mexican, Urban and Television. The complete list of winners can be found at www.ascap.com/news-events/awards/2017/latin-awards.